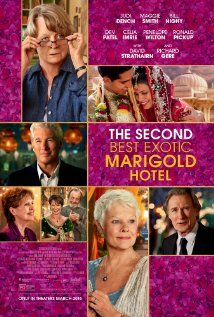 I am a huge fan of The Best Exotic Marigold Hotel, as it has some of the finest actors who have ever graced the silver screen. So when I found out they were making a second one, I practically wet myself with glee. Everyone brought with them their charm and humour for the sequel, though Dev Patel was a little too rambunctious and more over-the-top than he was in the first one. A lot of sequels suffer from un-intention, meaning that they were planned to have existed at all, so the writing is stretched thin and overused, because all the material was already used in the first one. This is not the case with The Second Best Exotic Marigold Hotel. While the sequel is not nearly as funny as the original, it’s only because it takes a more serious turn, rather than using tired or unfunny jokes. It’s still a witty film, that makes us think about all the things we’re too afraid to think about. A good chunk of characters are Indian, but the majority of them are white. However, that’s kind of made up for given the age of the characters. The backdrop of Indian architecture is just beautiful. And the hotel is breathtaking. This gets a 10 just for the wedding pieces. They were gorgeous! A timeless story about perseverance through setbacks. It reminds us that we can accomplish anything we set our minds to, no matter what our age.